Bourbon Teriyaki Pork Tenderloin Recipe - only 5 ingredients! Teriyaki marinade, bourbon, brown sugar, garlic and pork. SO simple and SO delicious! Can grill or bake pork. 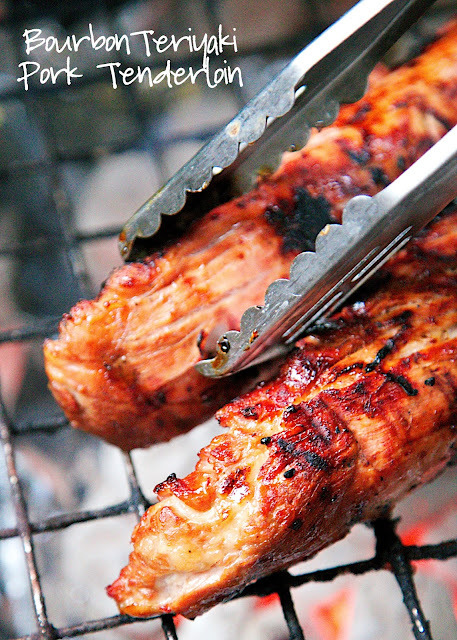 We made this Bourbon Teriyaki Pork Tenderloin for the first time on the 4th of July and LOVED it! We've made a several more times since then and really enjoy the flavors. My favorite part about the recipe is there are only 5 ingredients!! We grilled the pork, but you can also bake it. It will taste great either way. We always make the whole recipe and eat leftovers the next night. I like to cook a box of rice pilaf and add the sliced pork to it for a quick meal. We've also eaten the pork on sandwich buns with mayonnaise and hot mustard. YUM! Whisk together teriyaki marinade, bourbon, brown sugar and garlic. Pour over pork tenderloins and refrigerate several hours or overnight. 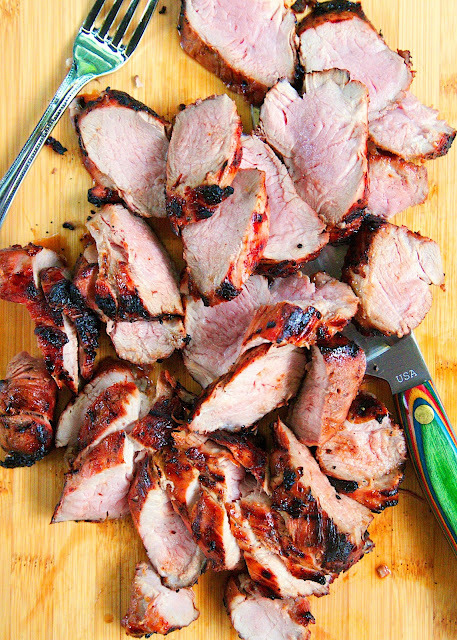 Remove pork from marinade and grill for 16-18 minutes or bake at 400 degrees for 20 minutes. We don't use alcohol...do you think it would be ok to leave out the bourbon? Or is there something I could substitute? Just get a small sample size of some bourbon like Jack Daniels. All of the alcohol cooks off so you won't be actually consuming any. Love, love, love this Steph! Can't wait to try it! The instructions call to dangerously undercook this dish. The picture also shows the meat being way undercooked. This dish is excellent when it is cooked to a minimum of 160F but as described it should be renamed, "Bourbon Trichinosis." Crunchbird - you are 100% INCORRECT. The FDA recommends that you cook pork to an internal temperature of 145ºF. Pork is 100% SAFE to eat at 145ºF. Looks done to me, and yummy. Going to try soon.